Looking to buy something online? Amazon. eBay. Walmart. Etsy. Best Buy. Target. Any one of them can help you out with extensive shopping portals and catalogs. E-commerce sales in the U.S. alone are projected to top $523 billion by 2020, with upwards of 270 million browsing and shopping on their mobile phones. The story is the same around the globe: online sales are estimated to be worth $136 billion in India, $55.78 billion in Canada, $1.7 trillion in China, £95.1 billion in the U.K., and $4.078 trillion worldwide by 2020. 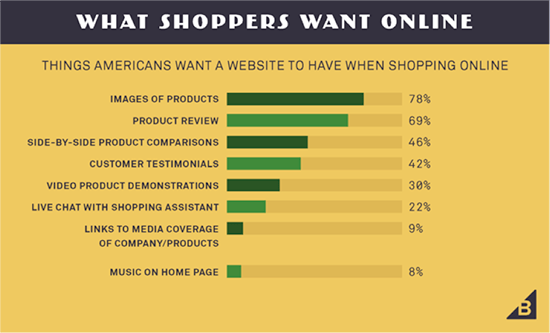 Online is the preferred way to shop for 51% of Americans. 96% of Americans have made at least one online purchase, with a full 80% shopping online at least monthly, 30% at least weekly, and 5% daily. The market is there. Including product videos can increase product purchases by up to 144%. 74% of American small businesses do not have an e-commerce website. Mobile is king. Companies that optimized their portals for mobile saw a 157% increase in revenue. There is existing demand, opportunities galore, and competition – while increasing every day – is not yet all that fierce (especially for small businesses). But it’s not as simple as just building your online e-commerce portal. Success means getting traffic to your site/pages, and converting them to paying customers. And optimize – for Google and Bing, of course, but you need to optimize as much for people as you do for the search engines. After all, it’s the people who are opening their wallets. Think about what they want, need, and wish for on each product page. How can you allay their fears, remove friction, and build trust with them? Consider A/B testing or split testing your pages to discover what will convert best for layout, color, design, placement, content, and more. Give them what they want – how and where they want it – in order to convince them to purchase and click that checkout button. That’s the whole point. Your e-commerce product pages need to be as close to perfect as possible for you, your brand, and your customers. You need to optimize each product page as though your life depended on it, because let’s face it, your business life does depend on it. A great product with a poorly-optimized page is NOT going to convert. It just won’t. Here’s what you need to do to achieve maximum results. It’s easy to dismiss the text – or copy – on your product pages. Everyone “knows” that it’s the images and reputation that sells. Right? You might even believe that most people don’t even read the text, which is at least partially true. We’ve become a culture of skimmers, scanners, and glancers. But words matter for everything from the page SEO down to the person-to-person conversion level. A recent study by the Nielsen Norman Group found that 20% of “task failures” (i.e. failing to convert and buy) could be attributed to poor copy on the page. Just as bad as poor copy is no copy. Too many e-commerce portals live and die by the “a picture is worth a thousand words” adage. And while it is true – more on that later – relying only on high quality images and videos makes you essentially invisible to the search engines. Crawler bots can’t “see” images on a page. To them and their search engine masters, the page is empty. Describe the product (and describe the visuals in the appropriate tags). Start with some good old-fashioned keyword research. As you know, not all words are created equal in the ranking game. Start with the basics. What is the product? Athletic shoes, screen protector, organic peanut butter? This is your base keyword. Go to Amazon – the king of e-commerce – and enter your starting word in the search bar. What suggestions does it give you? These are some of the long tail keywords people are looking for on the site. Next, try Google. Enter the base keyword. What does the autocomplete suggest? Scroll down the page to the “Searches related to” box to see other related suggestions. Examine the search terms people are using on your site if it’s been up and running for a while already. You can find it on Google Analytics under Behavior > Site Search > Search Terms. It’ll give you a list of frequently searched-for terms on your site from real users, and the Search Pages report can show you on which pages visitors are most often turning to search (possibly indicating unclear or insufficient copy on that page). Take your list of long tail keywords to your favorite keyword research tool. Google’s Keyword Planner is a fine place to start if you’re not sure where to go. Work your way down the list, looking for those keywords with decent search volume (remember, more is not always better), relevancy to your product, and a reasonable level of competition. Finally, consider checking with both Google Trends (to see the relative search volume over time…you want consistent or trending upwards) and Google and/or Bing (to see who’s already ranking on the first page…if it’s nothing but megasites, you may want to reconsider) for those keywords you’re zeroing in on. You should now have a few quality keywords for your page. Use your main target in the page URL (simple, clear, straightforward), title tag, product description (go for natural inclusion over squeezing it in X times), meta description, and alt-text. Do not – I repeat – do not simply go with the manufacturer’s product description. It’s boring, generally not targeted very well, and could land you in trouble over duplicate content. Take the time to write something compelling that includes your carefully-selected keyword phrase or phrases, and appeals to your customers. Use power words. Use words that pack an emotional punch. Highlight benefits over features. Put important details near the top of the description. Tell a story. Use short words, short sentences, and short paragraphs (every great writer, from Twain and Hemingway, to advertising legends like Ogilvy give the same advice). Anticipate questions and answer them. Consider concerns and alleviate them. Be specific, never vague. Be active, never passive. But above all, minimize both options and distractions. You’re not writing a book. You don’t want to require a visitor to spend 30 minutes reading a magnum opus to your product. Keep it short, simple, and specific. Product copywriting is a science unto itself, so as an e-commerce merchant, it’s well worth the time, effort, and energy to learn everything you can about it. While you’re at it, take a look at some of the high-quality plugins available for WordPress – such as Yoast SEO or All in One SEO Pack (3+ million installs each) – and e-commerce platforms like Shopify – Plug in SEO or SEO Manager – to make checking and inputting meta and tag details a snap. You know that a product page – just like a landing page, blog post, tweet or Facebook post – does better with visuals. So give them the attention they deserve. The Golden Rule? Consumers want images. Consumers want more than one, and they want them from multiple angles, with a 360-degree view if possible and appropriate. Make them high-quality, and make them plentiful. Consumers want to be able to zoom in without losing detail, and they’d like to see your product being worn or being used. Compress those images with a tool like TinyPNG. They’ll load faster and consume less data. Give them a logical and descriptive (use a keyword if it makes sense) filename. Don’t forget to use the alt-text to give your on-page SEO a little boost. The alt-text provides a textual description of the image so the search engines can understand everything on the page. If you’re using WordPress, uploading images can present a surprising number of challenges; images can show up on way too big, upside down, on the wrong side of the page, or not at all. If you have any issues, check out this article of WordPress image upload issues to troubleshoot. Finally, consider adding a caption under featured images if it makes sense to do so. Studies show that people read the captions when scanning a page, sometimes up to 300% more than they read the page copy itself. Include a video, whether that’s a video review, testimonial, tutorial, how-to, or product video. Consumers are 64-85% more likely to purchase after watching a video, or even higher depending on the product and industry. Regardless, video boosts conversions. That much is indisputable. Just as with images, though, you’ll want to only use high-quality video. Keep the video close to the CTA button, higher rather than lower on the page, and don’t set it to autoplay when someone lands on the page (people find that intrusive and irritating). Keep it under 5 minutes. Follow the latest video best practices to get the most bang for your video buck. 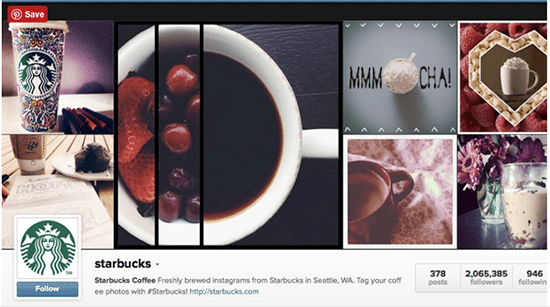 User-generated content – or UGC – is very popular and effective at the moment. What better endorsement could there be than real people using your product in the real world? So, ask for customers to submit photos and/or videos, and then embed them on your product pages. Scour social media for content that mentions your brand or product name, ask for permission to use it, and share that on your page, too. UGC builds credibility, trust, and confidence. Starbucks, Lululemon, and Spotify are just a few of the brands using it with wild success. Get in on that. Again, there are plenty of WordPress – such as PB SEO Friendly Images or WordPress Image SEO – and Shopify – including SEO Image Optimizer and Bulk Image Edit – plugins and apps to help with compression and alt-text generation. 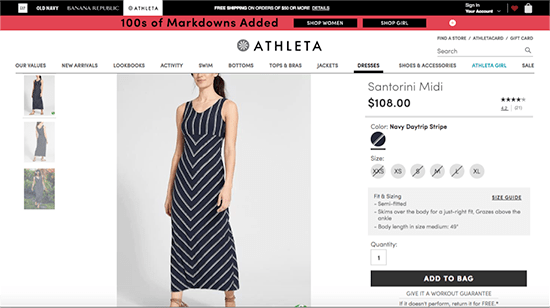 Now that your text and visuals have been polished to a brilliant shine, it’s time to consider some of the other elements and practices that take a product page from good to great. There’s a lot of competition out there for the consumer dollar. Online. Real world. In your neighborhood. On the other side of the world. To succeed, you have to offer the right product at the right price to the right person, and you have to make it easier (whatever that means) to get it from you than the other guy. It’s all about anticipating friction, and removing it. What questions might they have? Answer them. What concerns might they have? Remove them. Payment friction? Offer multiple payment options – Visa, PayPal, Mastercard, Bitcoin, American Express – so everyone can use their preferred choice. Cost friction? Stay competitive, keep shipping costs down – 44% will abandon a purchase if shipping is too much, while 73% expect it to be free – and eliminate hidden or surprise costs. Include an easy and free return policy – 81% of consumers look for that, and it can increase purchases by up to 357%. Quality friction? Offer a hassle-free money-back guarantee. 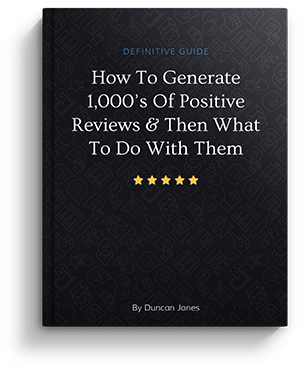 Include reviews, ratings, and testimonials. According to The Baymard Institute, the average online cart abandonment rate is a shade under 70%. Survey respondents said the main reasons for abandonment were: extra costs that were too high (61%), having to create an account (35%), a long or complicated checkout process (27%), and the fact that they couldn’t see the TOTAL cost upfront (24%). Keep shipping and other fees low if not free, provide a guest checkout option, make checkout super simple and fast, allow for calculating the total with one click, and you’re ahead of the game. What are your customers most concerned about, and how can you assure them and move them towards conversion? Put that right on the page. Consider implementing a live chat feature on the page – LeadChat and Pure Chat are highly recommended – or a chatbot – Chattypeople and Chatfuel are two good options – so visitors can ask questions and get immediate answers. 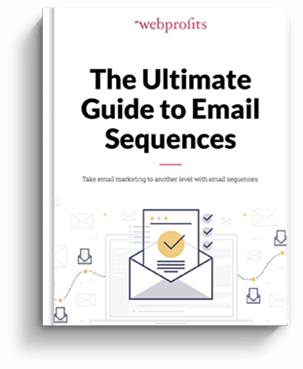 Email, comment forms, and even telephone numbers require them to leave the page without buying, and that’s counterproductive to what you’re trying to do. In fact, 44% of online shoppers believe that having a live chat option available is one of the best features an e-commerce portal can provide during the purchase decision. And that number is only going to climb: according to Gartner, 85% of customer service will be powered by chatbots in the next 3 years. 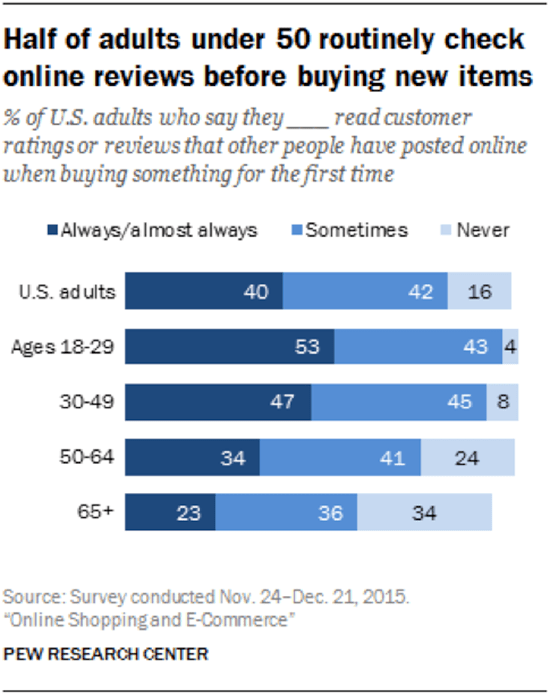 Trust is a major friction point for online consumers. They have to trust you, or they won’t be willing to buy and provide their confidential payment details. 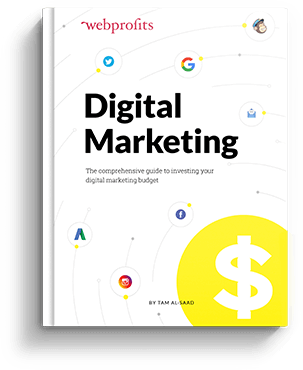 With so much competition for the e-commerce dollar, and so much fraud and fly-by-night “businesses,” you’ve got to quickly convince them you can be trusted. Use trust signals like customer reviews and ratings. Incorporate them on your product page, and make it easy for others to leave one. Plugins for WordPress and Shopify can make this effortless. 70% of customers are happy to leave a review if asked. So ask. 84% of people trust online reviews as much as personal recommendations. 63% are more likely to buy from a site with reviews. 68% trust reviews more when they see both positive and negative ones. Have relevant trust badges and site seals – security, associations, awards – prominently displayed. For those worried about online privacy and security, 69% look for trust logos and seals when shopping. Trust badges increased the perceived trustworthiness for 75% of survey respondents. Put your money where your mouth is with a money-back guarantee. Be honest and straightforward about everything: stock, availability, true cost, shipping time, reviews, certifications, and so on. Get caught in a lie or twisting the truth, and you’re finished (the internet never forgets). That same Baymard survey had 18% of respondents list “I didn’t trust the site” as their reason for not converting. There’s no excuse for being in that statistic. Your CTA on a product page is the purchase or “add to cart” button. But there’s more to it than that. Does the Add to Cart button stand out on the page? Is it a contrasting color? Is it ideally located on the page to grab their attention? Size, color, and placement can all be utilized to make it irresistible. Do some split testing to find the perfect spot and design, then make it the same across all of your product pages. Even your micro-copy – what the button says – can be optimized. 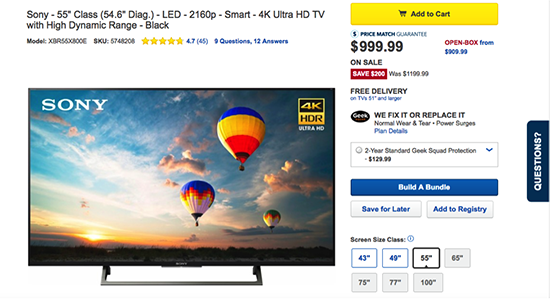 Does “Buy Now” convert better than “Add to Cart”? Test and find out. Your CTA button should be easy to find, the same across all pages, and call to your customers like Greek sirens to sailors. Having a clearly stated and competitive price is not the end of your pricing considerations. In today’s e-commerce marketplace, you have to optimize your prices the same way you optimize your pages and SEO. You’ve probably noticed that big e-commerce portals like Amazon and Walmart make dozens or even hundreds of tiny adjustments to their prices day-to-day. 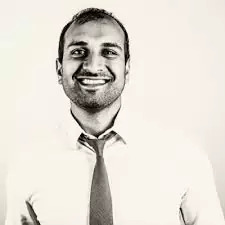 They have complicated algorithms for price optimization that analyze data from many sources – sales records, supply, demand, time of year, competition, and so on – to determine the best price for every item they sell. Small and medium e-commerce businesses can – and should – do that, too. You might not make daily changes, but monthly, quarterly, or annual adjustments make sense for every industry. Services like Prisync, Blue Yonder, and PriceGrid can do most of the hard work for you. Cost-based pricing. Determine the total cost for an item, then add your required profit margin on top, to get your ideal retail price. Market-oriented pricing. How do you compare to your competitors? Can you undersell them? Are you better reviewed (people are willing to pay more for better quality)? Customer-oriented pricing. Who are you selling to, and what’s your USP? Is it quality or price driven? Of course, that’s all very cold and data-driven. It’ll give you a ballpark figure, but to really zero in on your optimized price, you need to consider a little pricing psychology. Charm pricing. Reduce the left-digit by one – $199.99 instead of $200, for example – and we subconsciously see the price as closer to $100 than $200…even though that’s not true. This is a great tactic to present products as being a wonderful value and fairly priced. Prestige pricing. If your product is a luxury item, you might not want to give the impression that it’s a bargain. Prestige pricing is somewhat the opposite of charm in that you round to the nearest whole number: $100 instead of $99, or $40 instead of $38 or $42. Rounded numbers are easier to process and allow consumers to concentrate on their feeling…the “I want that!” impulse that makes them buy something luxurious. Anchor pricing. Also known as comparative pricing, this tactic requires you to compare two products – yours and a more expensive competitor’s – or list two prices – the regular price and the sale or recently reduced price. Either way, you start with a higher price, then end with your lower price. In the consumer’s mind, they’re getting a terrific deal. Amazon does this a lot with their catalog. And there are others: prices with fewer syllables convert better than those with more, prices with the comma removed are perceived as lower ($1700 vs $1,700), or the Rule of 100 (convey a discount as a percent for prices less than $100 but as a dollar amount for prices over $100…the discount seems bigger). Consider your customers and what is most important to them. Your text, visuals, CTA, and pricing are all big influencers. But there’s still more you could tweak, include, and consider to make your product page a conversion machine. Is your page mobile-friendly? If not, get it done. Most consumers will access your site via their mobile device at some point. In fact, only 11% of Americans access the internet exclusively with a desktop computer, and mobile accounted for 59% of all e-commerce sessions. Do you have clear (not clever), descriptive, and optimized categories and category pages? They’re just as important as the product pages, and deserve the same attention to detail. Have you used breadcrumbs on your site? If you have a lot of product pages and categories, you most definitely should. It makes for a better customer experience. Have you included social sharing buttons to encourage sharing? Do you have an “Add to Wish List” option? Both of these help keep your brand and product on their mind, and make it easy a) for a customer to come back to it later, and b) for you to follow up with some remarketing and retargeting. Did you use the Schema markup? With it, you can highlight prices, star-ratings, stock availability, and more on the SERPs. Is your page fast? It needs to be. 39% of consumers will bounce from a page that takes too long to load, and site speed is a ranking factor. Doubleclick found that 53% of mobile sites are abandoned if they take longer than 3 seconds. Use a tool like Google PageSpeed Insights or GTmetrix to test your page and do everything you can to make it faster and more efficient. Consumers want personalization. Personal recommendations, upsells, and cross-sells based on their onsite behavior. Are you doing that? 58% of customers are more likely to buy from you if you do. Pay attention to user behavior, and mine that data for insights and ideas. Use their first name wherever and whenever possible. Send a personalized welcome email after they sign up or make their first purchase. Monitor, measure, and manage your pages using an analytics solution. Which pages are converting well, and which ones are underperforming? Why? Which pages have the highest exit rate? Fix it. Replicate what works. Ditch what doesn’t. Product page optimization is an ongoing process. You’re never really finished or perfectly optimized, and there’s a lot more you could do beyond what I’ve listed here. But we all have to start someplace. Start here. Start today. 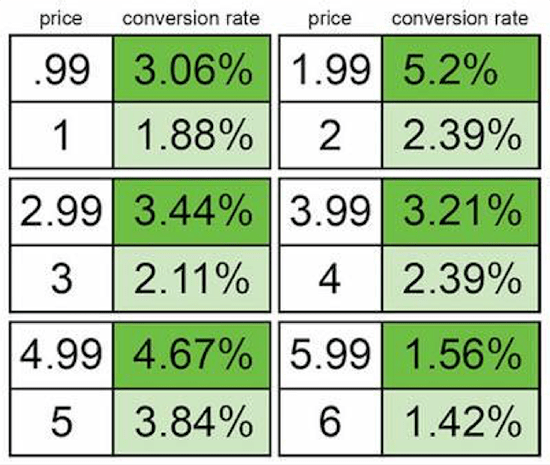 Optimize and increase your conversions.